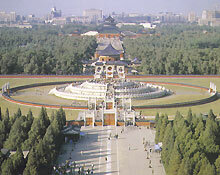 The Temple of Heaven is the largest group of structures in this world for rituals to pay homage to heaven. This was where 22 emperors of the Ming and Qing dynasties had presided over major ceremonies to pray to heaven for bumper harvests. The Temple of Heaven is a crystallization of the philosophy, politics, astronomy, music, architecture, and technology of ancient China. Good Harvest are the three major structures on the complex's axial line and the core of the entire complex. The Hall of Prayer for Good Harvest, where the emperors sacrificed animals and burned incense sticks to pray for good weather for the crops, is an immortal example of Chinese carpentry, and for this reason has become an emblem of Beijing. The compound of the Temple of Heaven is a world of imposing-looking ancient cypress trees. In 1918 the place was converted into a public park.